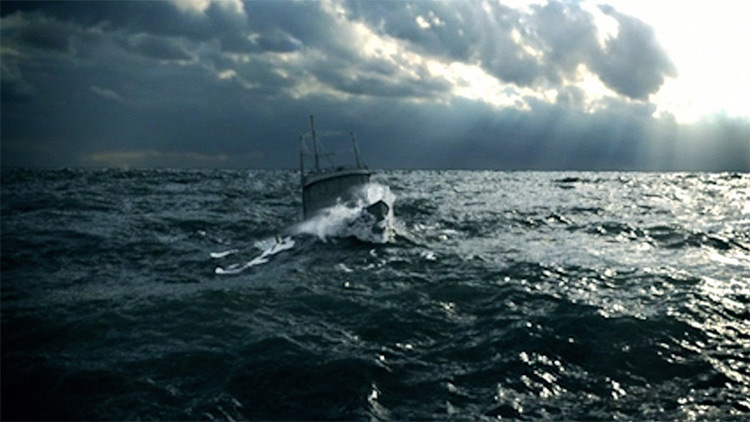 Houdini is a digital VFX program with many similar features as other compositing & 3D tools. While it has modeling and animation toolsets, Houdini is mostly used for visual effects work. It can create various types of pyro FX from a candle flame to a bomb explosion or water from raindrops. Not to mention, Houdini also offers a dynamic network where particles, rigid bodies, and fluids can interact with each other. Unlike other applications, Houdini focuses on nodal procedural generation. This makes the process initially difficult but over time much more flexible. While Houdini has become a little more user-friendly in recent releases, it still has a steep learning curve. Fortunately learning Houdini will give you more work opportunities as this program is becoming the standard effects tool in most VFX pipelines. In this tutorial you’ll take it slow and steady. You’ll learn how the Houdini interface works such as navigating in the viewport. You’ll spend most of your time in the node editor where the heart of Houdini lies. You will learn the basics of node behavior such as the inputs and outputs, using the invisible and disable flag to control data flow. You’ll also learn several workflows such as how to automatically connect nodes at a creation point. You’ll explore several nodes such as boolean and mountain nodes too. Later you’ll discover the shelf tools for quick pyro and liquid effects. Finally near the end you’ll create your camera, set-up your lights, and render your final images. Houdini is finicky. Even if you’re already versed in 3D workflow, you’ll still stumble every now and then. Hopefully this tutorial will help you get up and running with a very strong foundation. In most areas of this video you’ll learn techniques that can speed up your workflow. You’ll learn about Houdini’s integration with other 3D applications such as Cinema4D. You’ll also learn hotkeys to just get stuff done, such as hitting tab to easily search a node. There’s also plenty of technical tips such as creating custom attributes and using the geometry spreadsheet to troubleshoot your work. 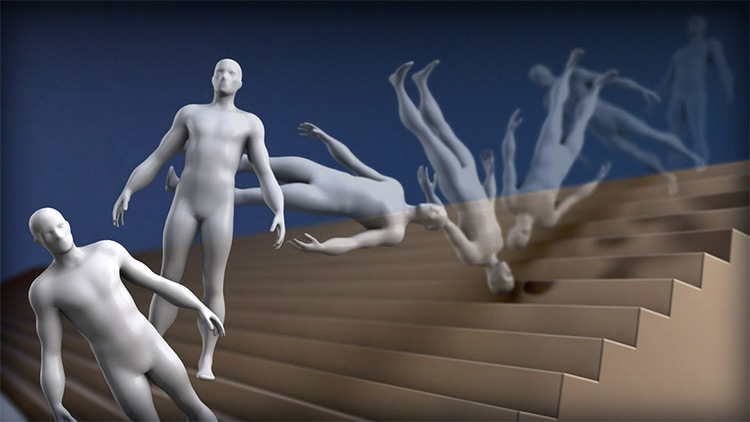 Houdini comes with a comprehensive rigid body toolset for your dynamics work. In this tutorial you learn the fundamentals of physics simulation in Houdini, which is applicable in every scene. You’ll learn how to create a dynamics operator network that houses all your simulation objects. You also explore rigid body solvers and what settings to modify to direct them, such as collision settings. Throughout this video you’ll animate these dynamic objects not by keyframe, but through their initial state. As a case study you’ll create several clones of a group of spheres using the copy-to-points node and drop them in a grid. Simple enough to write, but will take time to work through these lessons and understand the concepts. 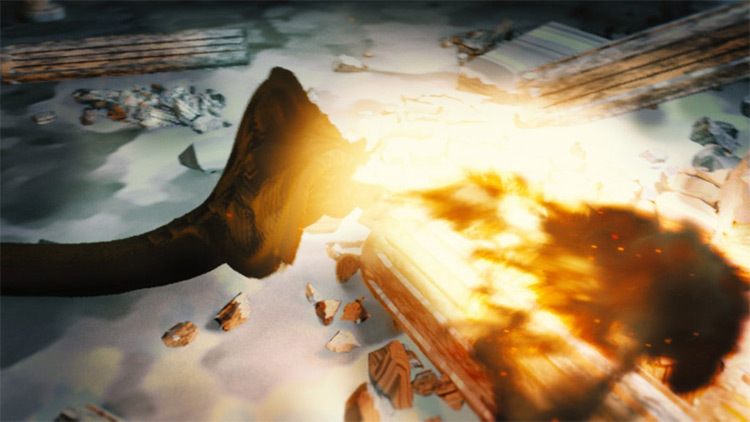 In this tutorial you start exploring a specific effect: disintegrating any object. The set-up is relatively complicated but here’s the thing: you’d better get used to the word “complicated” if you’re learning Houdini! You’ll first use a font sop with a poly extrude to set-up your base object. With the use of two boolean nodes you’ll use one to set-up the base object’s visibility and the other as a seam generator as a source for particle emitters. You’ll then use the particle operator source node to create your main particles. The particles sell the idea that an object is disintegrating as it slowly disappears. You’ll be increasing substeps to create a more accurate solve near the end. In the second part you’ll learn how to render the file using the principled shader and composite the output in Adobe After Effects. A common particle workflow is to transform from one object to another. In this tutorial you’ll learn how to adapt such a workflow. The author explores that transformations cannot be easily achieved using a typical blend shape node as it can’t be guided. By following this video you’ll distribute points using a modified scatter node. You’ll then use a ramp node from black to white to transfer points from Point A to Point B.
You’ll also utilize the sort node to determine which direction the particle transformation travels. After creating the base effect you’ll add advanced features such as noise and isolate the effect only to the point of transfer, thus creating a custom fall-off control (instead of a ramp) for better manipulation. Here’s one really cool tutorial where you’ll discover several ways of creating a liquid simulation using Houdini’s fluid implicit particle (FLIP) solver. The solver creates a stream of particles and converts them to meshes at render time. You’ll first create fluid from a mesh object. This means you can easily turn a simple box or a complicated airship into water. Then you’ll create a fluid using a water tank where you will be interacting with a rigid body. You’ll modify the water level to taste and adjust to the initial state of the dynamics to animate them by force. Later you’ll learn to easily create foam, spray, and bubbles from an existing simulation with a single click. Throughout the process you’ll learn time-saving workflows such as reducing inherit velocity and radial velocity in the white water emitter to prevent erratic behavior. You’ll also change the collision detection from volume collision to surface collision, all to accommodate the collision shape in the end. 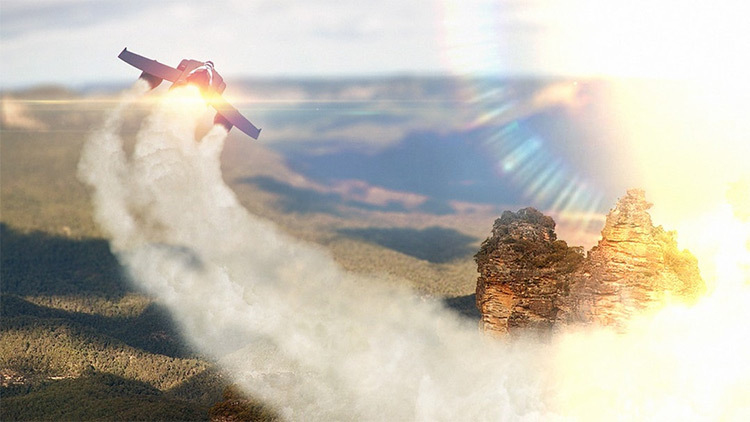 While Pyro is mostly used for practical fire effects, it can also be used for fun motion graphics pieces too. 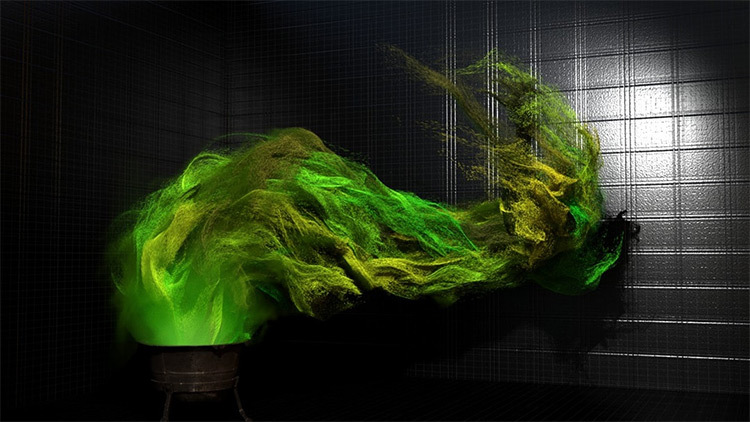 In this tutorial you get to make colored smoke that’s ultimately very fast to simulate. 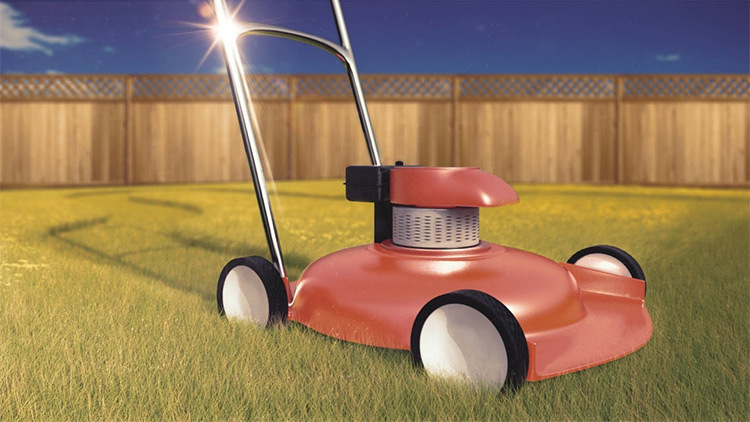 You’ll be using the handy shelf tools to create the initial look. By default, they come in black and white. You’ll derive the color from your picture of your choice using the attribute from a map node. You’ll then create a pop network driven by the velocity from the previous simulation. Pretty complex but it gets easier as you practice. In this free tutorial you simulate a fire, then shade and render it within Houdini using its default Mantra renderer. You’ll start with a sphere node then deform with a mountain node. Using the shelf tool you’ll create a smokeless flame. To tame your fire you’ll adjust the buoyancy lift and direction. After this you’ll adjust the simulation and combustion settings for a more accurate solve. With the creation process through the shelf tool, by default, you’ll have a newly created pyro shader. You’ll then modify the gradient to mimic a fire look. After lighting the scene you’ll create a final render node to export your images. Often times in VFX tutorials you’ll find people creating really cool audio visualizaers. Well this tutorial is one such example with a focus on Houdini, but this time through a geometry behavior rather than just simple bar graphs going up and down. This time you’ll also be exploring the channel node operator (CHOP) network. You’ll start with the spectrum to retrieve the data from your music. You’ll then use the resample node and learn how it works. On real-time play mode you’ll notice that the spectrum data does not coincide with the music. This is easily corrected with a shift node. You’ll then create a distance attribute that represents the audio’s magnitude. Afterwards you’ll dive in with vex coding to manipulate the geometry extrusion using the spectrum data. This leads you to eventually clamp and remap the data. Then you get to colorize your extrusion based on the audio’s magnitude. There are two main ways to create snow particle geometry. One is to actually simulate and the other is to create it procedurally. In this case we’ll learn how to create snow procedurally. The method can be used not only for snow, but also dust or any particle that will eventually lie down like confetti. You’ll be using the default squab practice geometry here to start. You’ll then create a bound node that will later determine the snow’s direction. You get to create the initial particle points using the scatter node with the relaxation turned off to lower calculations. By default, the points will not be enough to cover the whole mesh so you’ll regenerate points and use a point jitter node to further scatter particles. Later you’ll create various custom parameters to easily modify the particle density. The tutorial teacher here gives an overview of how to simulate splines on top of each other which can resemble worms. This is not a step by step tutorial so it’s tougher to follow along. Fortunately the author provides the source files for downloading to follow on your own. To achieve the effect you’ll be using particle nodes such as pop VOP, pop sprint, and pop network. You’ll modify particle attributes such as scale to achieve a realistic look. Later you’ll modify the mesh in ZBrush for further tweaking. The author also shows how to export the final effect as a standalone spline and render it with Octane in Cinema4D. In this advanced tutorial you’ll be setting up several node networks to create an electricity effect that can be useful for so many things: a character gaining superpowers, or a Tesla dome that’s about to explode. You’ll start with adding lines and create splines from the base geo. You’ll create branches that generate randomly with the help of a noise attribute. This leads to modifying the generation with the spawning attribute. Finally you’ll set up the scene for rendering and prepare it for compositing. You can check the project files to follow along. Geared to users that are absolutely new to Houdini, this massive course will help you get up and running with this powerful software. Note this video series won’t cover every single feature but it will be enough to get you started creating your own effects. You’ll start with the node-based workflow and proceed with the various parts of the pipeline from modeling, texturing, UV unwrapping, animating, visual FX and finally rendering. 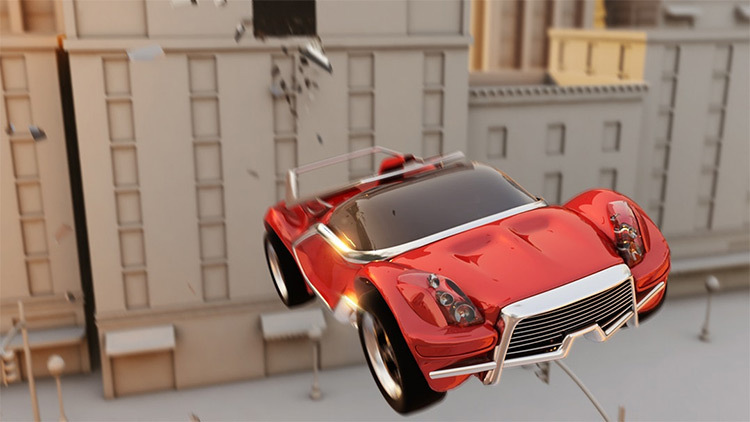 After you complete the series you will have created an FX shot that showcases rigid body simulations to a tee. Note this comes from Pluralsight’s video library and they offer a lot more stuff on Houdini. We actually did a lengthy review of Pluralsight’s video courses for CG artists so check that out if you want to learn more. While there are complicated solvers available to achieve stunning effects, particle work is a fundamental skill worth learning as it governs several workflows such as blocking, art direction, and finishing an effect shot. Here you’ll explore with particle operators along with the shelf tools to create some dynamic scenes on your own. This course teaches you how to modify several parameters such as source, forces, and sprites. Later you’ll also write some VEX code to fully control your particles. Dynamic simulation relies heavily on collisions. These collisions represent what the solver uses to calculate penetrations. While it is a one click process for simple collision objects(such as cubes or spheres), this is not the case for complicated objects that might require a separate collision object. In this series of tutorials you’ll learn how to prepare your geometry with best practices to proceed creating collisions. You’ll modify different settings such as the finite element solvers and cloth simulation settings. You’ll also avoid common mistakes such as not taking into account the object’s overall form during the workflow. In this more advanced tutorial you learn to create your own custom shading network that meets your specific needs. To follow along you need to have a basic understanding of Houdini materials. That topic is covered in most of the YouTube videos in this list, along with the beginner’s Houdini course on Pluralsight. Throughout this process you’ll create a shader from scratch with additional expose parameters that can be adjusted easily. You’ll then add a displacement feature to provide more details to your models. Well worth learning if you have the patience. 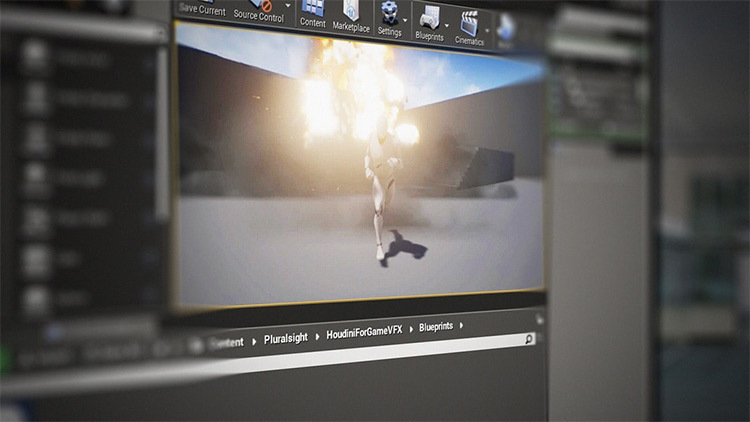 Starting with VFX film work, Houdini has also become a standard for VFX in video games. This course focuses specifically on VFX for games and helps game designers pick up the Houdini process. Here you’ll create an explosive effect driven by sprites with the end goal being a finished game piece. You’ll create secondary objects from debris along with many other features. The scene will include shockwaves and a camera shake effect. By the end of the tutorial you’ll learn a robust pipeline workflow between Houdini and the Unreal game engine. Being an FX artist, you need to master all the elements. Fire included. In this tutorial you’ll start with a pyro effect with two case studies: building a campfire and a fire-breathing effect. You’ll create the effects with both a preset shelf tool and also from scratch. Through practice you’ll mainly modify pyro solver settings such as fuel advection and sourcing methods. You’ll also troubleshoot erratic pyro behaviors. Finally you’ll render the scene with Houdini’s built-in pyro shader and Mantra renderer. Water simulation can mainly be divided into two parts: small and large scale simulations. In this tutorial you dive into the larger side of things. By the end of this series you’ll learn how to create a procedural ocean and later have it interact with a rigid body(in this case a boat) and generate foam with mist particles. You’ll also learn several production workflows such as not simulating the whole ocean but just extending it and adding displacement for blending. This course gets into plenty more detail with various ocean shaders ready for rendering. Here we have another pipeline tutorial but this time for Unity. Here you’ll be creating several Houdini Digital Assets(HDAs) that procedurally generate meshes, collisions, shaders, and unwrapping. 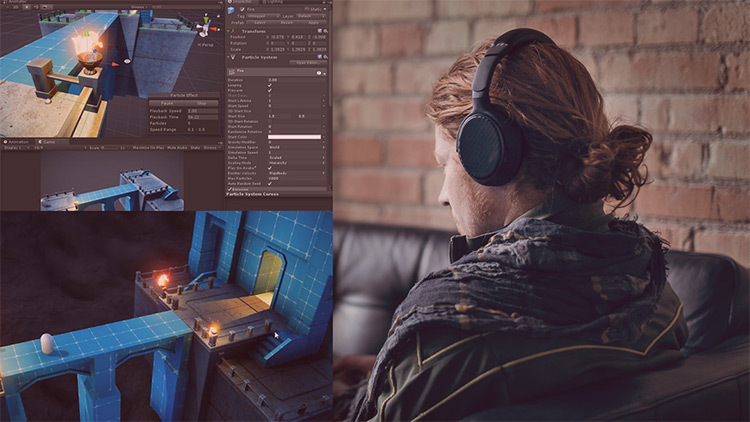 With the procedural workflow you’ll be able to deal with redundant tasks efficiently that will surely give you an edge from other artists working in the games industry. Throughout the tutorial you’ll also learn how to use the Unity software for testing your HDAs. Another powerful feature in Houdini is the ability to create custom tools. Aimed more at technical artists and directors, this course shows you how to create FX tools such as spline generations and particle flow tools. Building it from scratch, you’ll encounter concepts from vectors and trigonometry. And a whole lot more. You’ll learn various procedural approaches to implement the particle system with the help of the VOP networks for your setup. Finally you’ll prepare custom parameters for a user-friendly treatment no matter what type of project you’re working on. Probably not the most useful course if you just want to learn the basics. But I think this shows just how far you can take Houdini if you really need to. 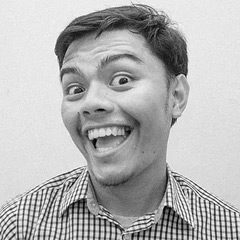 Ben is a stylized character rigger based in Davao City, Philippines. Proficient in Maxon, Cinema4D, and Autodesk Maya, he's available for remote freelance work with plenty of samples in his portfolio. What is Houdini & What Does It Do?